Flowers are very delicate to arrange, but with a perfect color combination, you'll get wonderful bouquets and flower arrangements. If you want roses, you can either have white roses dyed blue or mix white roses with blue flowers instead. 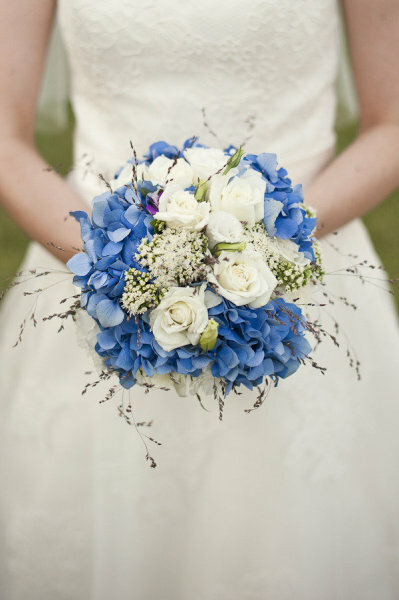 Blue and white wedding flowers can really make a striking combination. To add a dramatic splendor to your reception, blue and yellow flowers would be a great combination to use. The yellow flowers will lighten the color of your blue flowers. With yellow flowers as accents, you can embellish your decorations with gold ribbons and still won't look odd. You can use iris in blue and yellow as decorations in your reception, perfect as table centerpieces. Also, if you're wedding colors are blue, and you're going to wear a blue bridal dress (or have your bridesmaids wear blue), your blue wedding flowers cannot be seen in your wedding photos. So it is advisable to combine your blue flowers with flowers in different colors to make it stand out among the other blue wedding decorations. 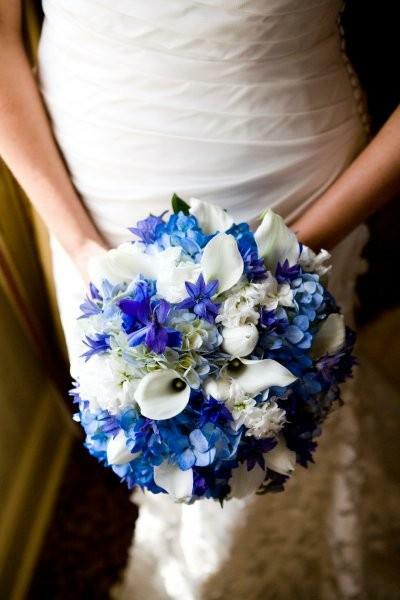 Blue flowers are not advisable to use if your wedding will happen during night time; use light colors instead. These wedding ideas will make your wedding planning a bit easier when you want nice floral arrangements for your wedding. Though arranging blue wedding flowers is somewhat difficult, it is very versatile that you can combine it with decorations in any color and have a remarkable effect that can only be achieved with unique choices. Finding the perfect match for your floral choices is like finding your groom; a bit tough but it's really worth it.